Breakfast: When the air is fresh and sweet, take notice! Enjoy breathing. It’s something that we do somewhat automatically. Enjoy every breathe. I love eating outdoors and breathing the air. There is a backyard where we are staying in San Jose and we’ve been taking advantage of it. We began working with our laptops on the picnic table drinking Earl Grey Tea. Gary and I just kept smiling. It was a pleasure working for the simple reason that the air was sweet and the temperature was perfect. Gary took a little time away from this paradise to prepare Breakfast Potatoes (small yellow, white and purple ones) made with onions, Chao Cheddar Cheese, Paprika, Garlic, White Pepper served with a Salsa/Guacamole dish consisting of leftover Black Bean Stew and Avocados and Sriracha an Sprouted Corn Tortillas. 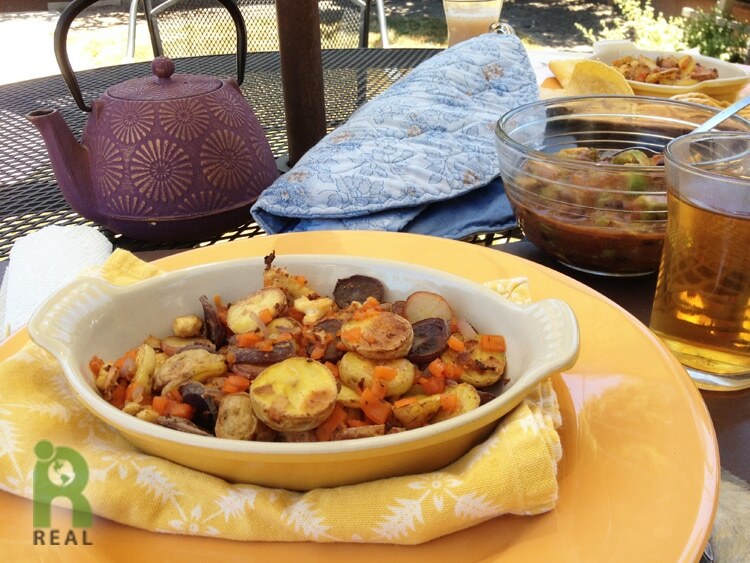 This meal was made to stick with us most of the day and it did. Dinner: I was invited by my friend Ann to the Diana Ross concert at the Saratoga Mountain Winery. I was excited! But I wasn’t feeling hungry and I needed to pack a dinner. I find it a challenge sometimes to prepare a meal when I am not hungry. 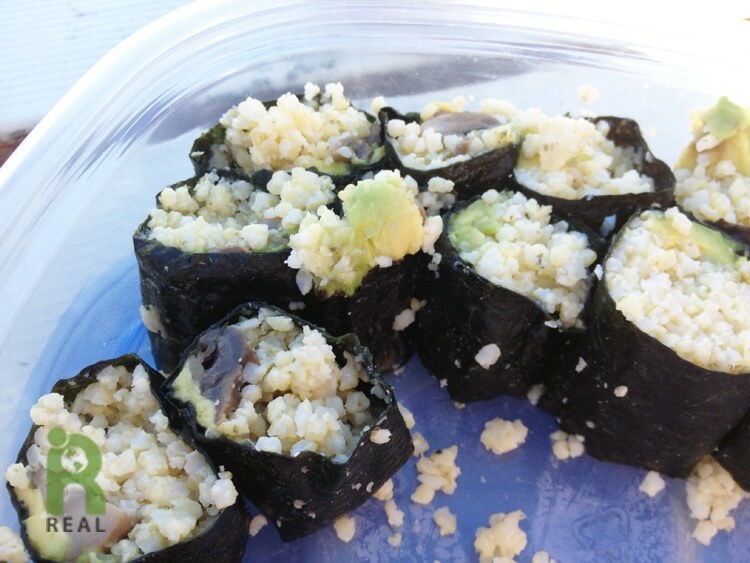 I had been wanting to make Millet Maki. That’s why I cooked a bunch of millet a few days ago. We didn’t have a bamboo mat for rolling maki. I used waxed paper a month ago and it worked okay but I didn’t want to do that again. When we were in Japantown on Saturday at the Obon festival we picked one up for $1.59. It was worth it! Making maki with leftover grain works best if you reheat the grain adding a little water to it. This rehydrates the grain and makes it stickier so it will pack well in the nori roll. But not being hungry and not in the mood for food preparation I skipped this step. I ended up with what I call Sloppy Maki because the millet was crumbly and spilled out the sides. I filled the roll with Avocado and Sliced Cooked White Mushrooms. 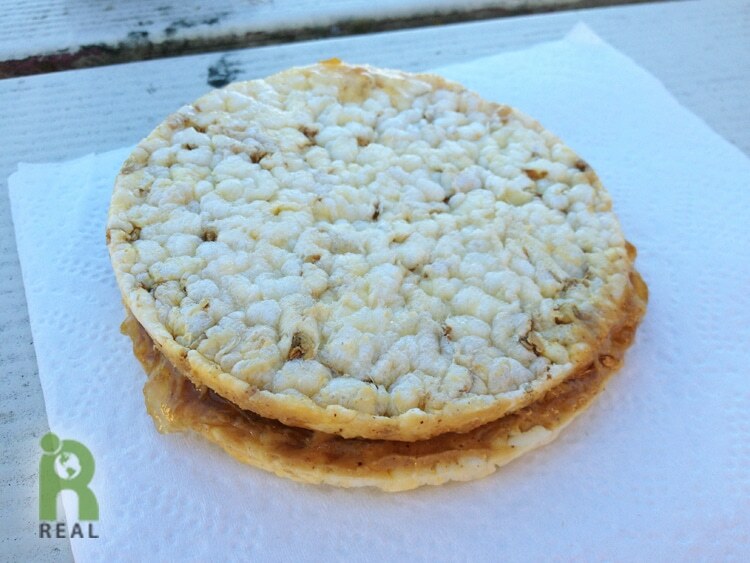 The good news is, when I ate them at the picnic table at the Winery they held together well. The second course was this stunning organic tomato. Almost everything we eat is organic and I don’t always specify that. 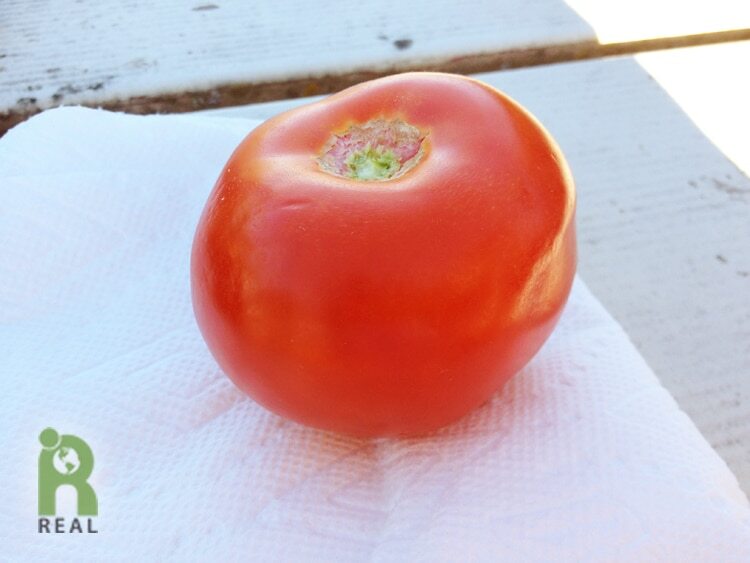 When a tomato is this good, I love eating it like the fruit that it is, biting into it and enjoying the flavorful juice. My dinner treat was Corn Thins spread with Peanut Butter and homemade Apricot Preserves. Evening: Another dish I had been wanting to make was Lemon Sherbert. Gary’s cousin Nancy gave a us a bunch of large, lovely lemons. I thought I would make something similar to our Orange Creamsicle Ice Cream recipe. I had peeled, sectioned and froze a few Lemons (about 3 cups with zest) days before along with 2 cups of Green Grapes. 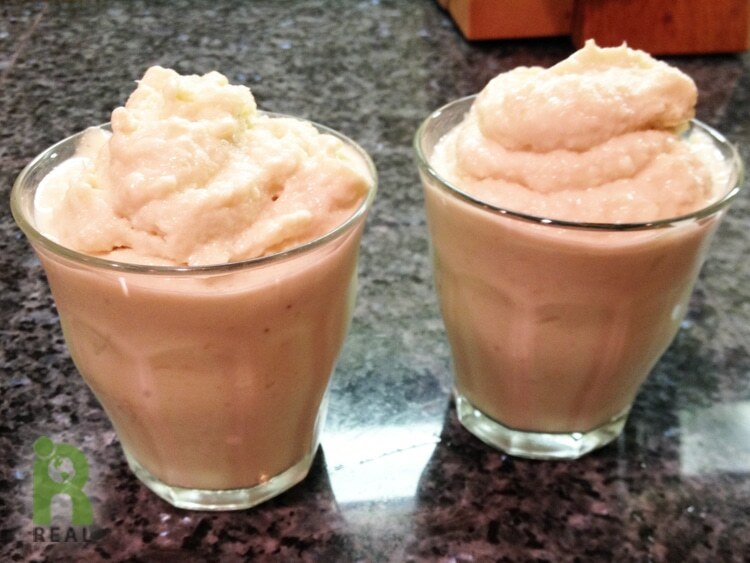 Earlier in the day I blended them with a cup of cashews that I had soaked and rinsed, plus water, vanilla and a banana. It was not thick like other frozen fruits I would blend. It was more like a thick smoothie. I put it in the freezer and thought it would be ready when I got back from the concert. Well, it wasn’t exactly. Some of it had frozen and some was still liquid. I stirred it all together and served it up. It was very tart, the way I like it. Find out in tomorrow’s post how it comes out after freezing overnight.